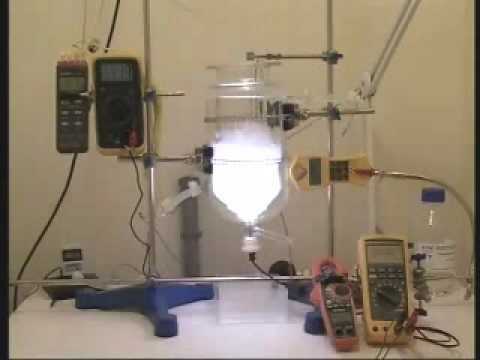 The CFR project is a High Temperature Plasma Electrolysis fully based on the Tadahiko Mizuno experiment from the university of Hokkaido in Japan. This is a very interesting experiment and its implication can be a real breakthrough in the field of New and Clean energy source…. The enhanced CFR is composed of a 2000 mL thermostatic reaction vessel filled with 800 mL of demineralized water and Potassium Carbonate ( K2CO3 ). The electrolyte solution commonly used is 0.5 molar ( 0.5 M ). and one probe is used for measuring the temperature of the electrolyte solution. You need also to use a flowmeter to measure the cooling water flow. The Cathode used is a 4 mm tungsten rod. The tungsten rod can be a pure tungsten rod or a Th-loaded tungsten TIG electrode (WT20) (with thorium oxide ThO2: 1.70% to 2.20% ) commonly used for plasma welding. The use of a Th-loaded rod increases the life of your cathod. The sputtering effect produced by the thermionic emission is lower with a Th-loaded rod than with a pure tungsten rod. The anode used is composed of stainless steel mesh ( a grid ) maintained with stainless steel rods. If you have planned to conduct some chemical analysis, I recommend you to use a grid made with platinum or nickel . All the wires connections are made with a 1.5 mm2 copper flexible wire gained with silicon. To avoid projections of some drops of the electrolyte solution from the CFR during the plasma ignition sequence, I recommend you to put floating balls on the surface of the liquid (hollow floating balls; pp, 20mm, 2000 PK from Cole Parmer Instrument ). Measure the temperature ( TSout ) of the output of the cooling water. End the run after ~3 minutes. ( set the voltage to 0 Volt and switch off the power supply ). Stop the chronometer (time). Measure the temperature ( TEout ) of the output of the cooling water. produced and make a pretty lighting effect. about you start by explaining how you aren’t dead from radiation poisoning? a pretty penny, I’m sure you could achieve cold fusion in a home basement. measure radio frequencies with a microphone. +Unrealistic Daydream Where are your results? of answer from me, but I’m not willing to give you one. So, where’s the neutron stream? the water from the high voltage. Right? Yer teeth and hair fall out, skin starts peeling, cant digest food.